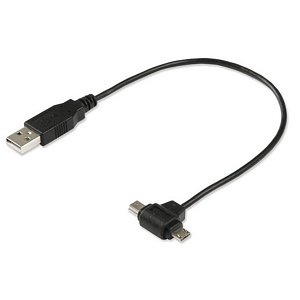 Carry one USB cord instead of two with a dual-headed USB cable adapter that includes both the the mini type 'B' (5-pin) and the USB-Micro connectors. The mini USB connector and the Micro USB connector work with digital cameras, GPS units, wireless headsets, smartphones, PDAs, e-readers, hubs and card readers. Please note, only one mini/Micro USB connector can be used at a time.